"... a new study shows that everyday activities can be just as beneficial as hitting the treadmill or doing your circuit training routine—minus the cash, sweat and annoying machine hoggers." ...43 percent of those who participated in the "short bouts" of exercise met the 30-minute-a-day physical activity guideline. Meanwhile, less than 10 percent of traditional exercisers did"
NYC parks department active recreation locations in your neighborhood can be found using the print versions of the Parks311 maps. 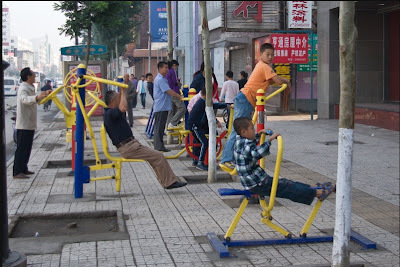 Our standard sidewalks are too narrow for this, but some of our sidewalk plazas or street plazas would have enough room for this kind of equipment. Park Chelsea expands: Citywide and Worldwide! Does Santa Claus still Live in Chelsea? What kind of parks do seniors want?